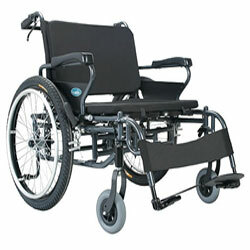 KM-BT10 is designed especially for heavy weight users. Its innovative curved frame design provides a solid structure that can support a max capacity of 250 kg. Foldable and robust curved frame design, solid and easy to store. 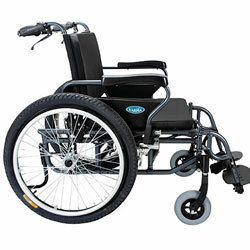 It uniquely offers 12 different combinations of seat and back cushions and 6 possible adjustments according to users' different needs. Unlike traditional X-shape frame structure which has the disadvantage of being unstable on uneven terrains, KM-BT10 is stronger and more stable even when it is fully loaded with 250 kg. Swing-away and tool-free detachable footrest brings huge benefit for users to move between places and for attendant to fold and store wheelchair easily. The lateral push-bar strengthens back support by adding greater firmness to the chair, and making it more efficient to push and navigate. Ergonomic armrest allows users to comfortably rest their elbows on the arm pads. Adjustable in left and right position.